On number one – no as with 99.9% of on and off road vehicles this particular design does not lean. There is no advantage to a trike that leans and many disadvantages. A leaning trike is no more stable than a standard motorcycle and offers no traction gain in corners. Essentially you end up with a normal motorcycle with an extra $10,000 wheel to maintain, it is simply a novelty item at best. On the other hand a Non-leaning trike offers the best handling and most stable ride without ground clearance and loss of traction issues of a leaning vehicle. On the second, as with a conventional trike it is stable easy to ride however unlike a wheels back configuration my design is built totally around steering, handling, aerodynamics and most importantly – a sporty and fun ride. The wheels forward design offers a host of advantages from economy to true adventure sport riding. There really is no comparison between a wheels forward and a wheels back conversion. Endeavor Trikes is the only Reverse Trike conversion that will fit all popular brand and models of motorcycles. Endeavor is also the only company that specializes in just Wheels forward conversions. It’s all we do so we do it best. However during braking or deceleration this foot print narrows significantly as the center of mass shifts forward and if turning is involved along with this deceleration then the “Triangle” becomes unstable as the footprint narrows and the inertial forces push outside of the lines of the triangle. Although under normal circumstances a normal trike is stable and safe I feel the Wheels Forward version holds an advantage. 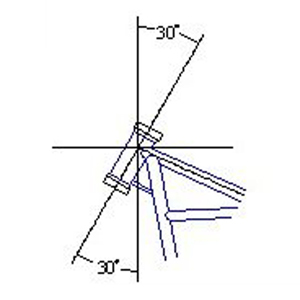 In the reverse trike configuration the basic straight line base footprint is about the same as a conventional trike (60 inches vs 54-56 inches). However during deceleration and hard braking the center of mass now moves towards the much wider stance of the two front wheels. And now while engaged in evasive maneuvers the center of mass stays inside the triangle which constitutes stability in design. Also during cornering centrifugal force will shift weight to the outside wheel so traction is increased dramatically. And ground clearance is never a factor as the non-leaning trikes maintain full ground clearance at all times. Also the Yaw rate on this type of configuration is shorter so the trike maintains a sporty quick feel. 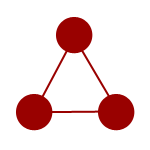 The reverse triangle configuration provides the most stability and safety where and when it is needed most. wheels forward design, great aerodynamics and improved braking there are two areas of concern. First – traction is not really improved as the motorcycle front end weight is divided between two wheels so effectively each tire provides half the traction of a single wheel setup. This holds true even during cornering. Second – ground clearance and cornering traction are still limiting factors. 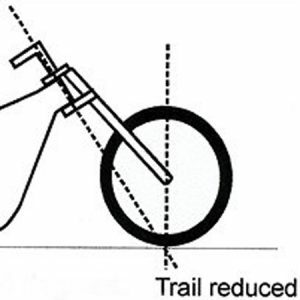 As the bike leans Centrifugal force begins to offset gravitational forces and traction is diminished and once things start to ground out tire traction ceases to exist. A leaning trike also suffers from increased Yaw rate (sluggish recovery time) due to all the added hardware and mass. 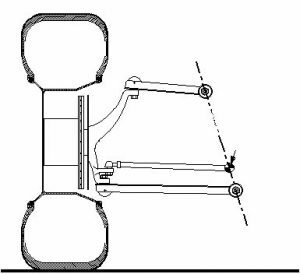 One major difference between a standard motorcycle conversion and Wheels Forward conversion lies in the fact a standard motorcycles steering is not designed for non-leaning. The rake (caster) is set to a rather large angle of 30 degrees. This is necessary for a motorcycle that leans into a turn. A two wheel motorcycle transitions from caster to camber (steer to counter steer) during speed changes where a trike or quad typically only uses caster to control turning and feedback. The Endeavor trike steering system is specifically designed for the conversion and for steering and handling. 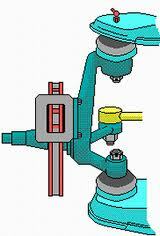 Caster (rake angle) is set to 2-8 degrees (100% adjustable) opposed to the approx. 30 degrees (non-adjustable) present on a standard motorcycle steering. The Wheels Forward trike takes advantage of all the basic designs present in mufti-wheeled systems. These design features are present in vehicles ranging from dune buggies to dump trucks. Caster, Camber, Offset and Toe.Caster controls straight line stability and cornering feedback. Camber controls tire center and with offset sets the wheel tracking during cornering. Toe simply compensates for camber and tire deformation. 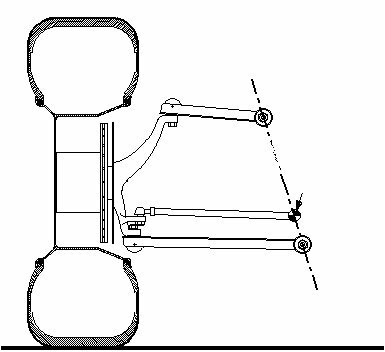 A reverse trike in most cases uses 2-8 degrees caster so steering is predictable and light. 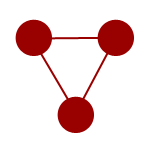 Straight line stability is also consistent and precise. Camber is set to 0-2 degrees and toe typically set to 1/8-1/4″ to compensate for tire deformation.The end result in the “designed for” configuration similar to what you would expect in an automobile or other conventional vehicle. A convention trike presents a rather large frontal surface area which causes substantial drag also the somewhat square back cause low pressure turbulence and added drag. This results in a reduction in available power, lower fuel mileage. A conventional Wheels back trike still uses the standard motorcycle tire up front and even worse a leaning trike uses three expensive motorcycle tires. These tires typically only last 18-22k and require large inflation pressure which translates into harsher ride and more expense in the long run. Typical motorcycle tires pressure is set to 36-42psi where the reverse trike automotive tires are set to 14-18psi. Motorcycle tires last less than 20k and cost approx. $200 each while automotive tires in this configuration cost as little as $65 each and last up to 50,000 miles. Also the braking foot print is much larger with dual car tires vs the narrow mc tires. Ride is more comfortable due to the dampening effects of lightly inflated car tires vs the hard unforgiving mc tires. Well all the GL series bikes already have reverse so that is not an issue. Reverse is available for Harley Davidson. In general reverse is not needed if you plan ahead and consider moving this type of trike around is very easy as you can focus all your efforts into pulling or pushing and not balancing.